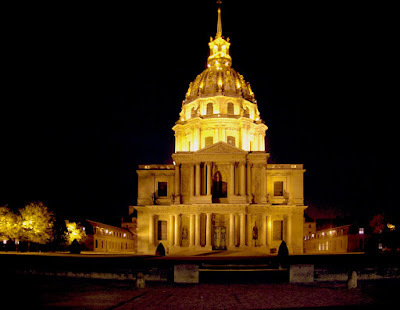 I'm just back from a dinner with good friends at Place de Breteuil in the 7th arrondissement and on the way back I passed by the Saint-Louis des Invalides Church which always amazes me! It was inaugurated in 1706 and it is still standing (well the golden globe had to be regilded 5 times since them, but still!). Wow, that's a lot of gilt! Is that the place that houses Napoleon's tomb? Marvelous, Eric. What a night scene. In this light, all is golden. One year, we had an apt for 2 weeks that overlooked the Dome, sigh. Mr. pHX enjoyed looking at the guards with the machine guns at the entrance for employees on the left of this picture. I forgot to add, our Eric came to visit, tried to take a picture, and was told from that distance, to STOP! Remember, Eric? Thanks a lot, for the beauty. I too have taken a lot of photos there as 50% of the time when I visit Paris I stay in a little quiet hotel just a few blocks from this site. It is beautiful day or night. We gild buildings in San Francisco too. I'm sure it is very expensive, but I have never heard one San Franciscan complain. It's gorgeous! 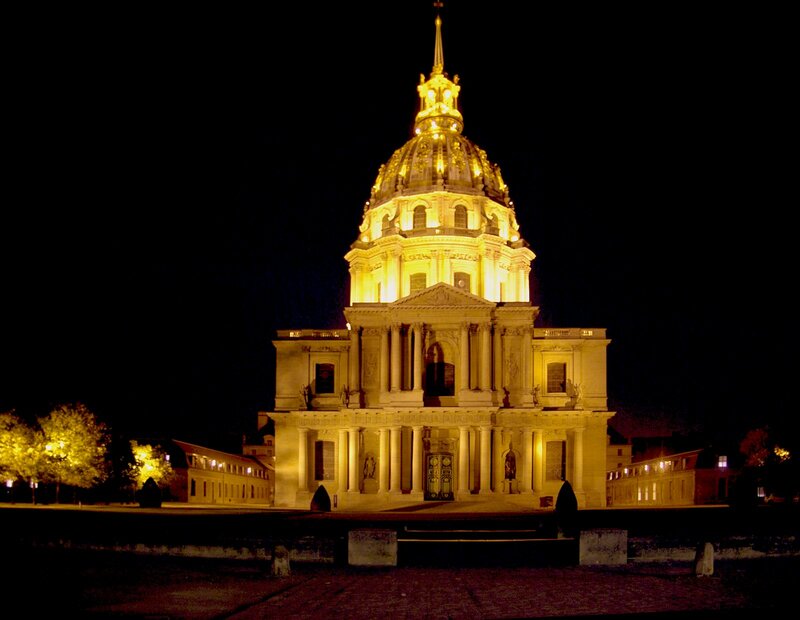 The beautiful building bathed in golden light with the dark sky behind....just lovely. Merci! Nice one Eric. A magnificent building. Love this glowing photo, Eric! @AJ -- Yes, this is the building housing Napoleon's tomb. One passes other monuments before descending to the lower level where the tomb is on center stage in a rotunda. What a life. Now I'm inspired to go see why he wanted this design, which sort of 'lowers' him - not the usual for a monument. Maybe some revolutionary posturing by the emperor! @Flore - I'm trying to guess about your first sentence. Is this the French equivalent of our "I see you haven't lost your touch" in English?! If so, I wonder if our phrase came from yours! I agree with you that this Church amazed most of us at night because it looks like a dreamy place at night. Great photo. I wish I could figure out how to get pictures like that. Great shots, Really good stuff.